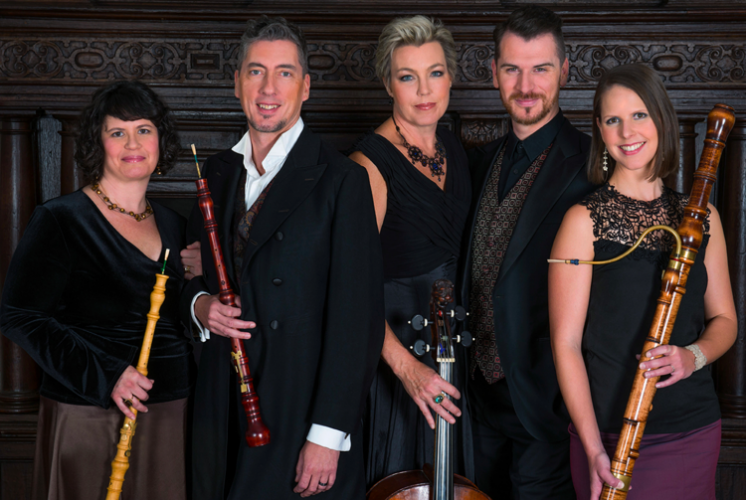 The ensemble Kleine Kammermusik plays music from Dresden and Paris on its new CD. 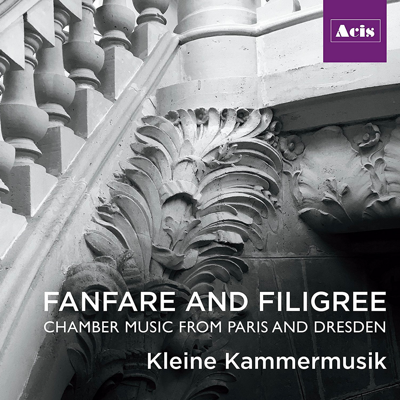 CD REVIEW — Battlefield meets salon in Kleine Kammermusik’s CD, Fanfare and Filigree: Chamber Music from Paris and Dresden, an evocative collection of attractive pieces for oboes, recorders, bassoon, and continuo by six composers active in those cities between 1692 and the 1740s. Louis-Antoine Dornel’s Sonata II, “La Triomphante,” and François Couperin’s La Steinquerque (which celebrates Louis XIV’s victory over the Holy Roman Empire coalition in the Nine Years’ War) incorporate the fanfarish sounds of battle, while other Couperin pieces and chamber works by Johann Friedrich Fasch, Pierre Danican Philidor, and Marin Marais conjure the more genteel world of the salon. In between stands a Jan Dismas Zelenka sonata — one of six only recently rediscovered — full of quirky harmonies and spicy accidentals. Despite the ensemble’s German-sounding name, the performers — oboists Geoffrey Burgess and Meg Owens, bassoonist Stephanie Corwin, cellist and gambist Rebecca Humphrey, and harpsichordist Leon Schelhase — are variously based in Philadelphia, the District of Columbia, and New York and regularly appear with many of North America’s top period-instrument ensembles. The group shows off its musical prowess from the beginning of the disc with a lively and well-crafted interpretation of Fasch’s Sonata in G Minor. The third movement swings with gently unequal rhythms, and parallel runs between oboes and bassoons are thrilling in the fourth. The sound of the bassoon’s key clicks only adds to the charm. The six-movement Dornel Sonata begins and ends with bellicose gestures, but the ensemble changes up oboes for recorders in the Sarabande for a nice variation of timbre. The Gavotte is stately, and the Sonata ends with a galloping Gigue. Two other Dornel excerpts — the Overture from Suite I, with its jolly fugue, and the stately Allemande from Suite III — feature unmistakably French gestures. Zelenka, a Bohemian by birth who spent most of his career in Dresden, played the violone, perhaps accounting for the interesting bass lines in his F-Major Sonata. Strange harmonic shifts and surprising accidentals characterize the third and fourth movements, and “Alberti” figures in the oboe lines suggest the level of virtuosity Zelenka requires from his performers — no problem for Burgess and Owens. 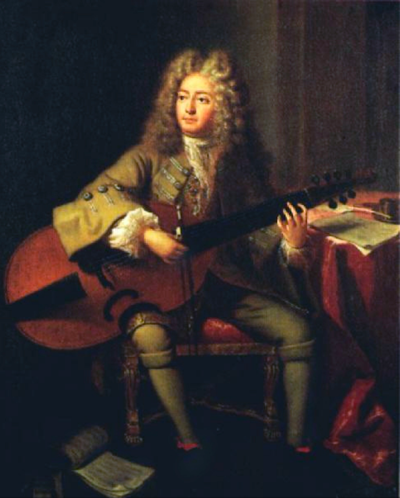 Marin Marais, painted by André Bouys in 1704. Seven movements from Couperin’s large collection Les goûts réunis are seeded through the second half of the album — pieces that ingeniously combine the warring French and Italian styles of the period. Lest the sonorities of oboe and bassoons become tiring to the ear, late in the recording Kleine Kammermusik wisely includes a Couperin suite for gamba and harpsichord, followed by a Philidor Suite for oboes alone. Marais’ Petite Passacaille restores the full ensemble — and what would a French program be without a Passacaglia? Fanfares and Filigree ends gaily with triumphant sennets from oboes and bassoons at the beginning of La Steinquerque, the rest of the piece alternating such joyful music with slow interludes featuring recorders. Recorded at the Curtis Institute of Music in Philadelphia, the disc shows the members of the ensemble off in the best possible acoustical light — the sound is present and authentic. Mike Telin serves as Executive Editor at ClevelandClassical.com and team-teaches classes in Music Criticism at Oberlin College and Conservatory.